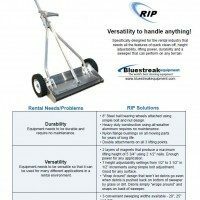 Wrap around design – when pushing through grass debris wraps around the back of sweeper. of The Push Type Magnets. Ready to handle any rental situation! 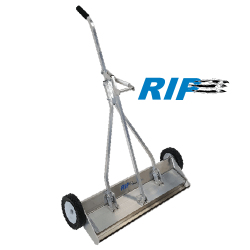 The RIP is the big brother of the Ecko Series magnet and is specifically designed for the rental industry and professional contractors that need all the features of quick clean off, height adjustability, loads of lifting power and durability for all terrains. Unique “wrap around” design for use on grass because it prevents debris from being wiped off by long grass or weeds. The debris simply snaps around on to the back of the sweeper. It also has loads of features including angled front “nose” design for pushing through grass, secondary debris release handle, simply pull and debris falls off, seven wheel height adjustment settings to fine tune the sweeping height for optimum performance and welded design construction to ensure durability. The RIP has a double layer of permanently charged magnets for greater magnetic field and loads of lifting power. "...you're not going to find a stronger magnet or better built magnet for sweeping all terrain than you will from Bluestreak...there is nothing you're not going to pick up with this magnet. " Nothing Compares to this Push Magnet. When renters go to the trouble of renting a tool, they want to make sure they rent something that can get the job done. And renters can throw almost anything at a tool, and the tool better be up to the task. The RIP is up to the task. The seven wheel height settings allow you to fine tune the sweeping height to ensure maximum performance in any rental situation. The angled front nose makes it much easier to push through grass, all the pivot points have nylon flange bushings so there is no metal on metal contact, meaning no squeaks, long life, and a nice tight feel to the tool. And the feature that is used the most, the handle, was specifically made three pieces to give the handle sturdiness and durability and also contributes to the tight feel of the sweeper unlike many single piece handle designs on the market. “Wrap Around” feature designed for pushing the magnetic sweeper through grass. The “Wrap Around” feature prevents debris from being brushed off by grass once picked up. The debris just wraps around onto the back side of the magnet instead. A performance test to show the pickup height of the RIP magnetic sweeper. We’re using a 2 1/2 inch nail for the test and the RIP is picking it up at a 5 and 3/4 inches height. 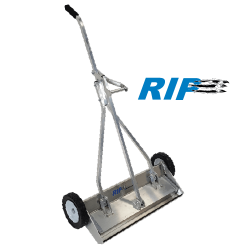 The RIP has 7 wheel height settings to adjust the sweeping heights from .5″ to 3.5″ to accommodate any situation. Height adjustment allows fine tuning of performance on a variety of terrains and conditions for optimum performance. Debris release handle lifts magnetic housing out of the tray. Debris then drops off the bottom of sweeper, no lifting or bending over. 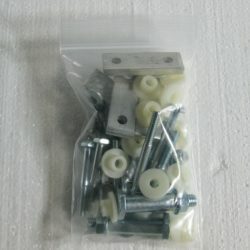 All moving parts are protected by nylon flange bushings to reduce wear and extend sweeper life. Double layer of permantently charged magnets for greater magnetic field and lifting power. Angled "nose" to allow easier pushing through grass. Available in 3 sweeping width sizes 20", 25" and 31". Double attachments on all three lifting points to increase durability. Rugged three piece "Y" handle design for sturdiness and durability. 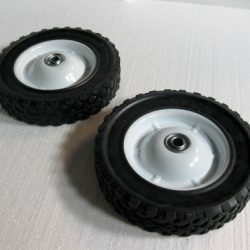 Sturdy 8″ steel hub and ball bearing wheels for durability, easy manoeuvering and easy pushing. 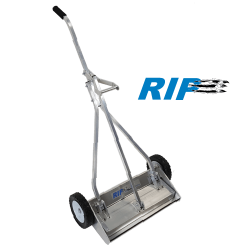 Control the sweeping height with 7 wheel height settings of .5 to 3.5″ in .5″ increments to accommodate any situation. Rugged Durability. 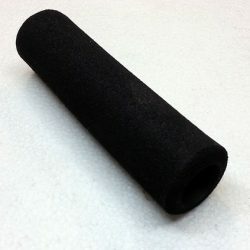 All moving parts are protected by nylon flange bushings to reduce wear and extend sweeper life. 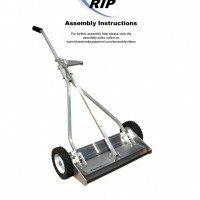 The sweeper stands upright on its own when not in use, so no stooping over to pick it up all the time and it reduces the risk of having it accidentally run over by a vehicle. Welded design for extra durability and long life. * There are no CAD drawings available for this product. It does everything I hoped it would do. 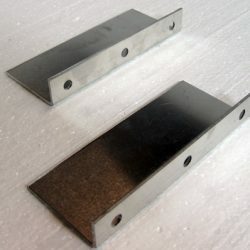 Metal corners and edges should be buffed and smoothed better, I got a few nasty scratches during assembly. Overall a very good product that works as advertised. This is a much more powerful magnet than any of the other ones Bluestreak produces to my knowledge and therefore a much more powerful magnet than you're ever going to find on the market. Out of any place I've looked, your not going to find a stronger magnet or better built magnet for sweeping all terrain than you will from Bluestreak. The biggest downside is the weight but there is nothing you're not going to pick up with this magnet.